Today, I was thinking about Mardi Gras and cupcakes, so I am wondering does anyone bake special "King Cupcakes" for Fat Tuesday??? Let us know and send us recipes and pictures! 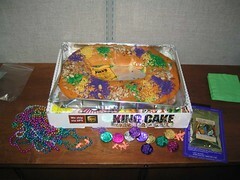 I went to a Mardi Gras party in NOLA about 5 yrs ago and the host served cupcakes with the plastic baby inside. My daughter got one with a brown plastic baby - you don't have to just use the pink ones. I'm making yellow cupcakes with nutmeg and cinnamon added and decorating with colored sugars for a school bakesale here in Calif on Tuesday. One cupcake will have a baby tucked inside and will be sold to kids who want to find a baby (not the younger ones who would swallow it).